On the road again! Time to add another state to Weston's list. State #4 will be Arkansas. We are off to Eureka Springs for the weekend! Nothing is better than stopping on a road trip at a small town diner and being blown away by kindness, deliciousness, and ambiance. The coffee shop in ____ did that and more. It was quaint and unique and wonderful. The front eclectic tables and chairs and couches to drink coffee or play games. The back of the coffee shop stepped it up even more with a treasure trove of used books for patrons to read, trade, or just thumb through. Cute little spot... so glad we stumbled upon it! We arrived in Eureka and had a smooth check in to our "homeaway" for the weekend. Our group was our typical duo, plus my husbands parents and our little man Weston. We COULD have stayed in a hotel, but that ended up being more expensive and we wouldn't have a kitchen, possibly wouldn't have been downtown, and we wouldn't have the space to just be together! So homeaway.com was PERFECT for our group. Our "homeaway" was nicknamed Autumn Bluff Lodge was a 3-bed, 2-bath home directly on Main Street. Couldn't have been better! We each had our own room and plenty of space. After arrival, we decided to take a drive towards Beaver Lake. Toby and I were going to sneak away Saturday morning for some over due scuba time near the dam. It had been nearly 2 years since we scuba dove due to the IVF treatments and then the whole "being pregnant" thing. 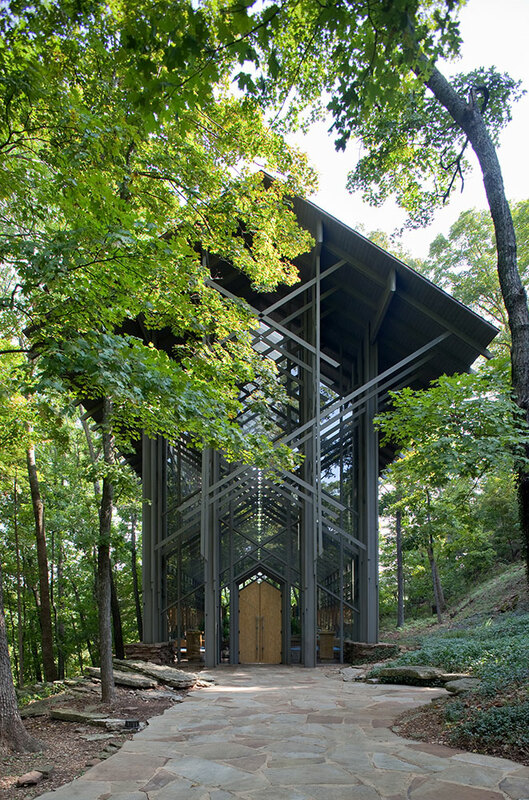 On the way to check out where we would dive the next day, we stopped at Thorncrown Chapel. We had been here a few years ago for a friends wedding (Love you Jake & Meg!) and the place had not lost any of its Wow Factor. Second picture is from Thorncrown website because I simply couldn't do this place justice. After checking out Thorncrown and the lake, we headed back to Eureka to clean up for our early dinner when the hidden gem opened at 5. We were told "get there early or you'll wait 45 minutes." Well, that's exactly what happened. Apparently, they secretly start seating between 4 and 4:30 because the place is always jam packed. Want to know what the name of this hidden gem is? Ermilio's Italian Home Cooking and it was phenomenal. I had the salmon and ate every single bit of it. The rest of the table was just as satisfied with their meals, but I think the bread with garlic spread is what really sold them. Note to self: cooking whole cloves of garlic and smushing them on bread is a fabulous idea. Next day, Toby and I ran off to scuba dive and left Weston with his grandparents to play at our home away from home. The water was FREEZING. Not so bad on surface at 75degrees.... in a 3/5mm wetsuit with additional 3mm hood. 60ft down however, it was literally 58degrees. I thought my fingers were going to break off. I think thats the only time since we have been together that Toby was really *jazzed* to hold hands. Beaver Lake has some pretty cool little spots to go diving. We chose the bank just West of the Beaver Dam. Along the North side of this little camping peninsula there is sunken boats, diving platforms, jet skis, etc. Makes diving in a lake instead of the open water a little more bearable. We only went about 35ft deep for this first dive so we weren't frozen to the bone yet. Our second dive was along the East side of the peninsula (still on the West bank) where we swam through trees. Seeing the sunlight through these trees 45-60ft deep was pretty incredible. Murky water or not, this was really beautiful. After we rinsed off the murky water, we headed back to town for some real food. In contrast to the morning we were HOT and starving. We found a little coffee shop and split a sandwich, while Toby indulged in a much needed chocolate shake and I ordered 2 macaroons (swoooon, these are my fave!) and a brownie. Scuba diving is a pretty good workout... right? Time to explore the artsy neighborhood! One of the biggest treats of the trip was stopping at a few art galleries that had drinks and snacks and great conversations. Toby's mom and I could have stayed all night, but we had to appease our men and head to dinner. This time we took the art gallery directors suggestion and headed to Cottage Inn. I am SO glad we got this suggestion and even more glad we didn't keep driving once we pulled up. You see, the restaurant is in a pink little cottage that vaguely reminiscent to an old folks home I once visited... but once inside? LOVE! Once past the reception area, there were just a few small tables. We were sat at the one against the wall that had a church pew as a bench for one half of the table. It was covered with comfy pillows and it was really charming. The wait staff was decked out in tuxedos and it really didn't feel cheesy in the moment at all. Even with our baby there and just wearing white shorts and a t-shirt, I was feeling very classy. Choosing dinner both nights was a little difficult due to my lactose-intolerance and Southern people's love of cheese, but I managed to find some mushroom ravioli in a red sauce that hit the spot. The real challenge was dessert. Everyone each ordered their own dessert (full of that delicious lactose) and they were all HUGE! I'm talking the whole table could have easily split 1/2 of just one of these desserts. We were definitely sleeping well that night! Moral of the story: Local people know what they are talking about when it comes to dining!! And the old "Don't judge a book by it's cover" still stands tried and true. Next day we packed up and headed home. It was a wonderful trip and I look forward to our little Deen getaway with Toby's parents next year.